This is your chance to follow some numbers and see where they go! A simple rule is all you need. 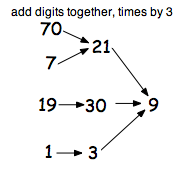 My first suggestion is to add the digits together then multiply (times) by $2$. The first number that I chose happened to be $56$. We multiply the $11$ by $2$, $2 \times 11 = 22$, and that's the first part of the journey. We multiply the $4$ by $2$, $4 \times 2 = 8$, and that's the second part the journey. Now, $8 + 0 = 8$ and $8 \times 2 = 16$ and that was the third part. $10$ leads to $2$, $2$ leads to $4$, $4$ leads to $8$ and we are back to where we got to in the second part of the journey. Oh! So we are on the same bit as before, a circular bit that goes $2, 4, 8, 16, 14, 10$ and then back to the $2$ again. Now a new starting place, $96$. Oh! So we now have a smaller circular bit of the journey that goes $6, 12$ then back to the $6$. I explored further trying to start with each number from $1$ to $99$. Then I tried similar, but different rules. There are $99$ starting points to try and I've only show you $8$ on each of the two above so there are lots more to explore! Decide on the rules you will use and investigate what happens with different starting points. You might invent your own way of recording your findings. We'd love to hear how you got on. Area - squares and rectangles. Practical Activity. Trial and improvement. Interactivities. Working systematically. Addition & subtraction. 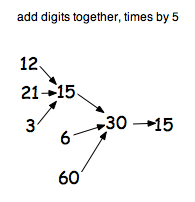 Multiplication & division. Generalising. Combinations. Investigations.